Simple: Klocwork Cahoots provides a clean, simple environment for developers to perform code reviews in. Core functions such as starting a review, participating in a review, performing a search and adding reviewers can each be completed with one-click. 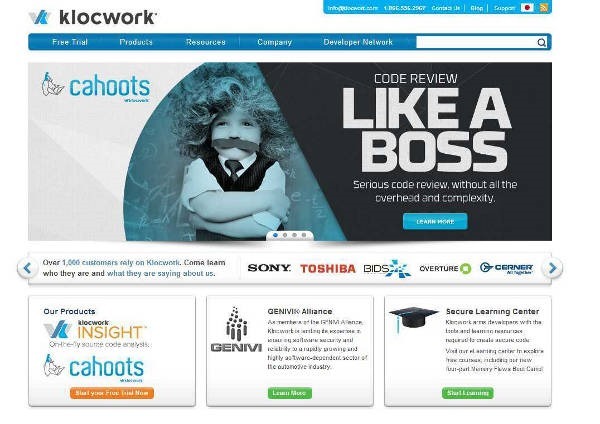 Social: Mimicking the interactive nature of social media, Klocwork Cahoots makes it easy to engage in, contribute to and stay up-to-date on all elements of active code reviews. Developers can follow individuals, teams and code components via customizable feeds, monitor activity on an infinite wall, and take part in threaded discussions available on each line of code. Personal: The customizable nature and opt-in functionality of Klocwork Cahoots allows developers to work where and how they like to work. Developers can design their own workspace as well as discover activity and participate based on their own interests. Fast: With a focus on getting things done quickly, Klocwork Cahoots provides real-time notifications on the latest activity, and offers an intuitive search function so developers can find the exact code, comment or activity they’re looking for. The tool also allows custom, graphical reports to be generated in seconds, using drag and drop pivoting.